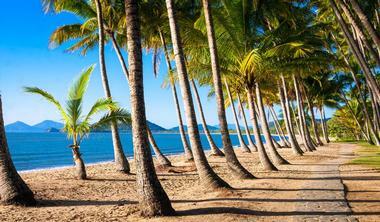 The gateway to the Great Barrier Reef, Cairns is a picturesque, coastal city in Tropical North Queensland, Australia. 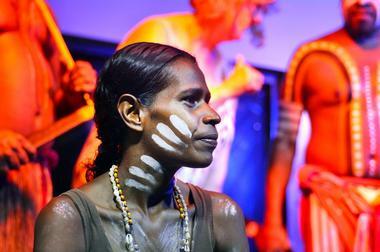 The residents of Cairns fully embody Australia’s casual and laid-back lifestyle. The city offers lush, steaming rainforests, romantic palm-fringed beaches, and rugged outback countryside. The city’s ability to deliver unforgettable adventures and modern luxuries makes it a desirable vacation destination. Australian Butterfly Sanctuary is a marvelous butterfly exhibit and zoo that is situated in the heart of Kuranda, Queensland, Australia. 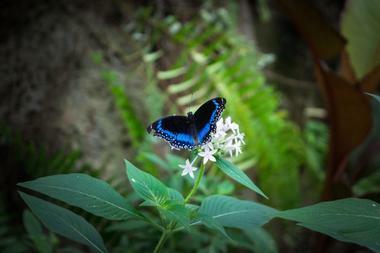 In 1989, the sanctuary received recognition from the Guinness Book of Records for having the ‘Largest Butterfly Farm in the World.’ Initially created by Sue and Paul Wright, half of the sanctuary was purchased in 2004 by the Woodward Family CaPTA Group, and the remaining half purchased by the same company in 2007. There are several experiences and exhibits for visitors to enjoy, such as the Butterfly Myths & Legends Display, Guided Aviary Tours, Museum, Pupae Area & Emergence Cages, and Silkmoth Display. Located in the Cairns region of Queensland, Australia, Barron Gorge National Park is an incredibly beautiful National Park that extends from the elevated regions of Atherton Tableland to Australia’s coastal lowlands. The park features fascinating history, diverse wildlife, tropical rainforests, powerful waterfalls, and rugged mountain scenery. The Barron River dominates much of the park, winding 60 kilometers across the Atherton Tableland and through one of the highest rainforest belts in Australia. The river offers an idyllic setting for a number of water activities, such as kayaking, canoeing, scenic boat tours, and whitewater rafting. 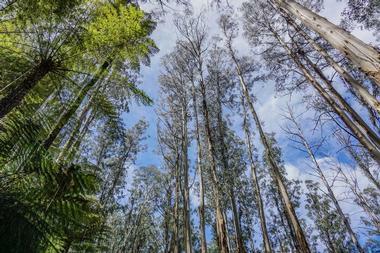 Wildlife viewing is plentiful here, visitors may see tree-kangaroos, possums, spotted-tailed quolls, and flying foxes. Australian Armour and Artillery Museum is a massive museum that is dedicated to armored vehicles, artillery, and tanks from World War II and post war years. This unique museum is located in Cairns, Queensland, Australia, and officially opened its doors for the first time in 2014. The museum offers several interesting exhibits for guests to explore, such as Tanks, Armoured Cars, Armoured Personnel Carriers, Anti-Tank Guns, Anti-Aircraft Guns, Tank Destroyers, Field Guns, Howitzers & Mortars, Specialist Vehicles, and Self Propelled Guns. 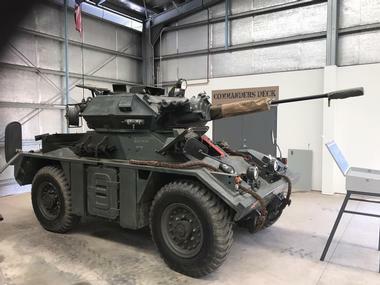 Visitors will see everything from the Australian Sentinel Mk1 tank to the Canadian Ram Kangaroo personnel carrier to the United States Staghound armored car. Birdworld Kuranda is a place where visitors can immerse themselves in a unique wildlife attraction provided by Wildlife Tropical North Queensland. 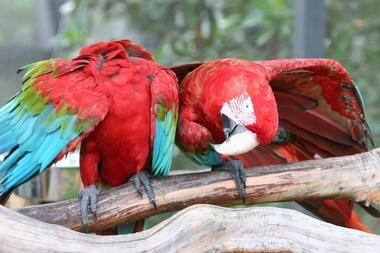 Birdworld is situated along Rob Veivers Drive, within the Kuranda Heritage Markets. The beautiful rainforest setting within the enclosure provides a wonderful habitat for its vast collection of birds from all over the world. The sanctuary houses many of Australia’s most beautiful and precious species of birds. Naturally landscaped with native and exotic plants, ponds, and waterfalls, the sanctuary replicates the habitats of nearly 60 different species of bird. Visitors will see everything from cheeky rainbow lorikeets to cassowary’s to cockatoos that include Galahs. Cairns Aquarium is devoted to providing a world-class venue where visitors can see and interact with the magnificent animals, plants, and habitats that can only be found in Australia’s Wet Tropics Region. The Aquarium is located in the city of Cairns, Queensland, Australia. The Wet Tropics borders two World Heritage environments; The Great Barrier Reef and the Daintree Rainforest. Founders Andrew Preston and Daniel Leipnik have a profound passion and vision for conserving and protecting the biodiversity of the two World Heritage ecosystems. There are over 15,000 animals from 71 habitats and 10 different ecosystems across Tropical North Queensland within the aquarium. 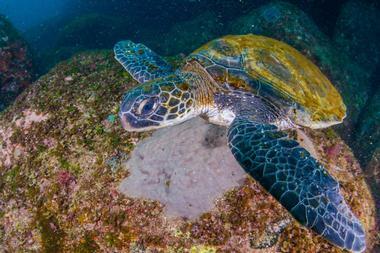 Visitors can also enjoy guided tours of the Cairns Turtle Rehabilitation Centre. 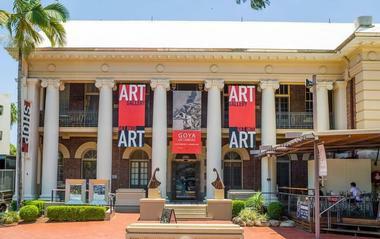 Cairns Art Gallery is situated within a restored government building from 1936, in Cairns City, Queensland, Australia. This award-winning gallery opened for the first time in July of 1995 and boasts three floors of elegantly designed gallery spaces. Designed by government architect, R.C. Nowland, the building’s construction began in 1934 and was completed in 1936. The building retains much of its historic charm, including iron balustrades, stained glass windows, polished timber-wall paneling, and terrazzo floors. The gallery is equipped with a café and gift shop that features children’s toys, books, homewares, specialty items, and jewelry. Visitors will find rotating exhibits that include works ranging from ceramics to paintings to photography to cultural artifacts. Cairns Botanic Gardens is known for having one of the very best tropical plant exhibitions in all of Australia. The gardens are situated within the Cairns suburb of Edge Hill, in the Australian state of Queensland. There are several attractions within the gardens for visitors to check out, such as the Flecker Gardens, Fitzalan Gardens, Nature Playground, Rainforest Boardwalk, Bamboo Collection, and Zhanjiang Friendship Garden. There are also a variety of tours for visitors to enjoy, including audio tours, bird watching and walking tours, and free guided tours. Visitors can come and relax in the garden’s stunning surroundings, explore tropical plants, and learn about horticulture. Cairns ZOOM and Wildlife Dome offers a wildlife park and challenge ropes course in Cairns City, Queensland, Australia. This leading Cairns attraction is situated atop the Reef Hotel Casino. The wildlife park aims to provide a top-notch sanctuary for its animals that include mammals, reptiles, and birds. The park allows visitors to enjoy up close and intimate encounters with the animals. They believe education is the most effective way to ensure that these species maintain longevity on this planet. The park also features a power jump, external viewing walkway, three ziplines, and several different challenge elements. For more fun, the park recently added Commando Rope Climb and Slacklining and the Pirate Climb. Crater Lakes National Park is a beautiful National Park that is located in Queensland, Australia. 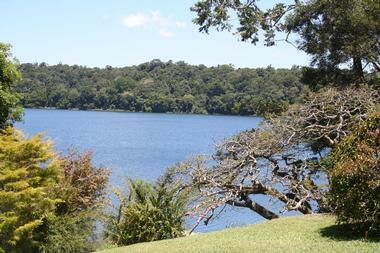 The park features two separate volcanically-formed lakes, Lake Eacham, and Lake Barrine. 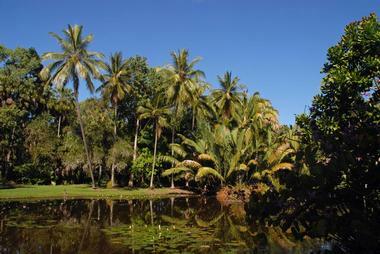 The lakes are surrounded by lush green rainforest and filled with clear blue water. The shimmering Lake Barrine has several features around it that include giant pine trees, a walking track, and a privately owned treehouse; visitors can book boat cruises around this lake. There are also several water activities to enjoy, including fishing, kayaking, and paddle boarding. Lake Eacham provides a wonderful setting where visitors can enjoy birdwatching, swimming, shaded walking tracks, and picnic areas. The park also provides restrooms, BBQ fire-pits, and trails for cycling. The Daintree Rainforest is a marvelous forest region that is located along the coast of northeast Queensland, Australia, just north of Cairns. 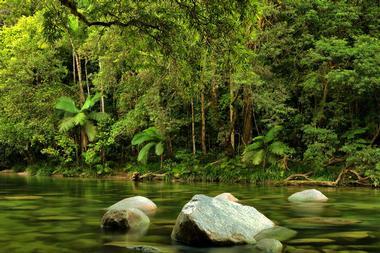 At approximately 1,200 square kilometers, Daintree is part of Australia’s largest continuous tropical rainforest area. High quality guided walking tours showcase exceptional rainforest integrity and unique biological diversity. Discerning travelers can access Daintree Rainforest either through a four-hour Greater Wilderness Experience or a two-hour Grand Fan Palm Gallery Tour. During the tours visitors will be immersed in the stunning beauty that surrounds them in one of the world’s oldest rainforests. Visitors will see several different species of mammals, spiders, reptiles, and birds. Davies Creek National Park is a wonderfully picturesque National Park that is located in Queensland, Australia. The park offers restrooms, a picnic area, and a two-kilometer walking trail that leads to the Davies Creek Falls. The granite outcrops and eucalypt woodlands deliver an incredibly beautiful and tranquil setting for visitors to enjoy. The park plays an important role in the conservation of endangered species, in fact there have been five threatened or rare species identified within the park. The park provides an idyllic setting for outdoor recreation, such as camping, hiking, and mountain biking. Outdoor enthusiasts and nature lovers will appreciate all that Davies Creek National Park has to offer. Fitzroy Island is a breathtakingly beautiful island that is situated approximately 29 kilometers southeast of Cairns, Queensland, Australia. The island is a locality within the Cairns Region. There are a number of sites to see, activities to partake in, and attractions to explore all around the island. 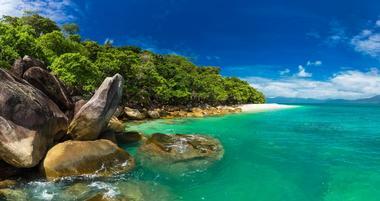 The island has been largely untouched and is protected as the Fitzroy Island National Park. One of the island’s beach’s, Nudey Beach, was ranked #2 on Brad Farmer’s list of Australia’s 101 Best Beaches, 2017. Visitors can enjoy snorkeling in the crystal clear, turquoise waters and explore the beautiful coral reef that surrounds the island. There’s also hiking, paddle boarding, and a water trampoline. KickArts Contemporary Arts is a contemporary visual arts organization that is located in Cairns City, Queensland, Australia. For more than 25 years KickArts has been a significant contributor to the cultural life within this region. 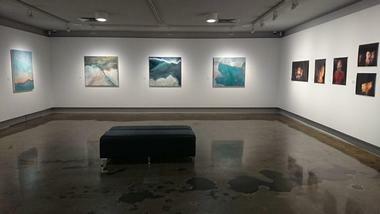 It is a gathering space for audiences and artists to engage and learn about the contemporary visual culture. The vision of KickArts is to develop iconic contemporary art installations for the visitors and community members of Tropical North Queensland to admire and appreciate. Some of the past exhibits include Megalo to Murray Island by Arone Meeks, My Bleeding Heart by India Collins, Mornings in the Studio by Anne Toppin, and Head in the Clouds by June Tupicoff, Ben Trupperbaumer, and Ron McBurnie. Kuranda Koala Gardens is an exciting wildlife park that is situated in Kuranda, Queensland, Australia. Visitors to the park will have the chance to enjoy some up-close encounters with some of Australia’s unique wildlife species. They’ll also have plenty of chances to view koalas doing what they’re best at – which is sleeping, eating, and looking adorable. Patrons can even cuddle one of the koalas and have a digital picture taken as a souvenir. There are many other species at the park, including freshwater crocodiles, wallabies and kangaroos, wombats, snakes, lizards, monitors, and several other reptiles. 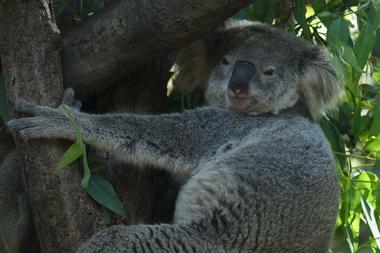 The Koala Gardens are an excellent, fun-filled attraction that is fun for everyone. Kuranda Scenic Railway is a beautiful stretch of railway line that extends from Cairns, Queensland, Australia, to the town of Kuranda. The Cairns Railway Station and its dedicated platform are situated in the center of Cairns. 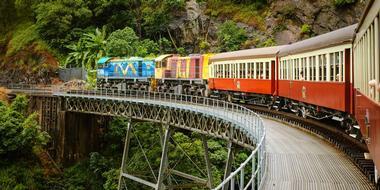 At this station visitors will be able to book their scenic trips to Kuranda. The central location of the station makes it an easy walk from most of the city’s accommodations. There’s also free parking at the Cairns Central Shopping Centre right next to the railway station. During the trip patrons will enjoy breathtaking views of Australia’s Wet Tropics and its incredible array of different animals and plants. 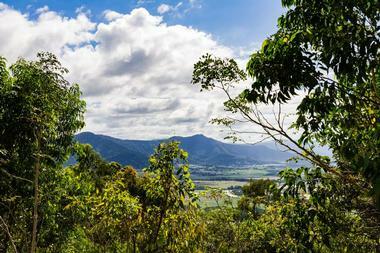 Mount Whitfield Conservation Park is a tranquil conservation park with scenic viewpoints and shaded walking paths in Whitfield, Queensland, Australia. The park’s forested range is completely surrounded by Australia’s urban development. 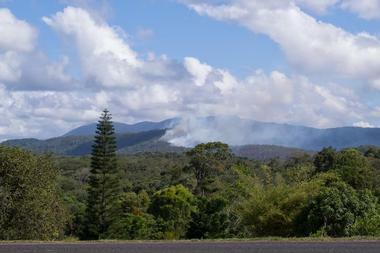 Rainforest dominates the landscape, but there are patches of grasslands with cycads and eucalypt forest. Situated near the heart of a developing city, the park provides a popular location for the town’s people and hikers to escape for a little peace and serenity. Visitors will have plenty of outdoor recreational activities to choose from when visiting this park, including picnics, cycling, hiking, walking, camping, and wildlife viewing. Visitors will likely spot a couple of ground-dwelling birds upon arrival, the orange-footed scrubfowl and the Australian brush-turkey. Situated approximately 30 minutes north from Cairns City, Australia, Palm Cove is a charming seaside village with an esplanade that is lined with hundreds-of-years-old melaleuca trees. It’s a village where locals prefer travel by bike over car, where fresh fish is enjoyed at sunset barbeques all along the beach, and where visitors can carve out a little slice or paradise for themselves. There are several places where visitors can rent paddleboards and kayaks for some fun water activities, they can also take tours to the nearby Double Island. Palm Cove is home to several award-winning restaurants for visitors to explore, many of which are waterfront establishments that offer breathtaking panoramic views. 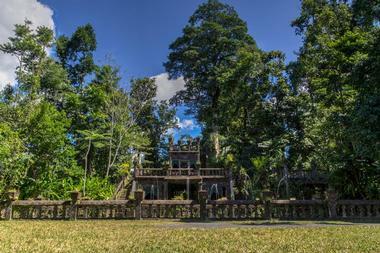 Paronella Park is a National and State Heritage listed site, as well as a National Trust listed property that is located in Mena Creek, Queensland, Australia. Jose Paronella had a dream of building a beautiful castle in Australia. His dream became a reality when he built a castle, tunnel, bridges, tennis courts, and a picnic area on five marvelous hectares of land beside the Mena Creek Falls. The park is covered with over 7,500 tropical trees and plants that have created a lush rainforest. The park has been open to the public since 1935 and has garnered numerous Queensland tourism awards. 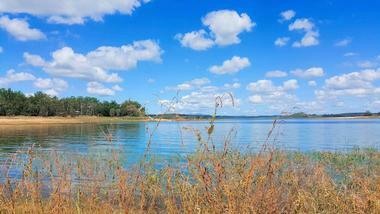 Visitors can enjoy fish and wildlife feeding, camping, and hiking. Rainforestation Nature Park is a wildlife park that is situated on 100 acres in Kuranda, Queensland, Australia. 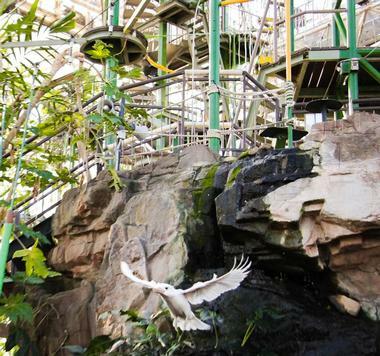 Located within a World Heritage rainforest, the park was originally opened in 1976. The property was formerly an orange and coffee plantation. There are a variety of fun experiences for visitors to enjoy, such as the Pamagirri Aboriginal Experience, Army Duck Rainforest Tour, Koala & Wildlife Park, Koala & Croc Photos, and Bush Tucka Walk. The park is also equipped with a gift shop and several different dining options that include Tropical Treats Juice Bar, Outback Restaurant, The Treehouse Restaurant, The Colonial Restaurant, and a World Famous Barbeque Buffet. Visitors can see Cairns, Queensland, Australia, like never before, falling at speeds of up to 135 miles per hour over a tropical paradise. Skydive Cairns offers an exciting experience that is sure to get the adrenaline pumping and “wow” its visitors with breathtaking views. Jumping out of an airplane 15,000 feet over Cairns is unlike anything any local or visitor to Australia has done. Skydive Cairns offers one of the only ways for visitors to enjoy views of both the tropical rainforest and Great Barrier Reef at the same time, with a little added thrill. 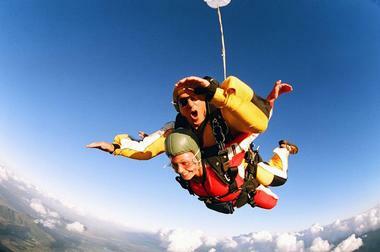 Skydive Cairns offers tandem skydives for beginners so no one is left out. Skyrail Rainforest Cableway is a scenic cableway that runs above Barron Gorge National Park, within the Wet Tropics of Queensland, Australia. 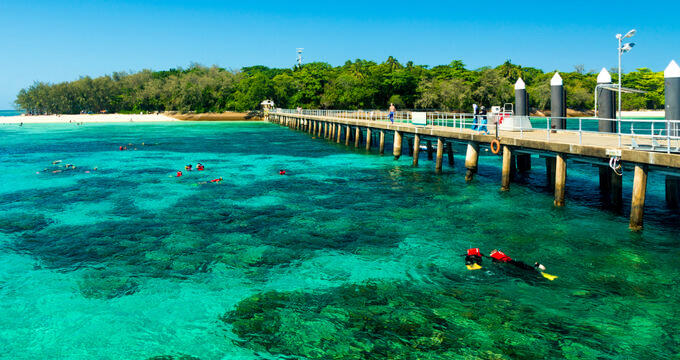 It is located just north of Cairns and has garnered over 25 awards. 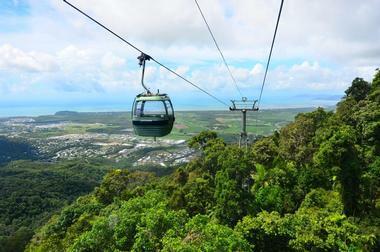 Consistently voted one of the top things to do around Cairns, the Skyrail offers a unique vantage point for viewing Australia’s World Heritage listed Wet Tropics. The cableway glides several meters above the rainforest’s canopy as it descends from top to bottom. The Skyrail experience can take anywhere from 1.5 to 2.5 hours, including the return time and stops at two rainforest stations. 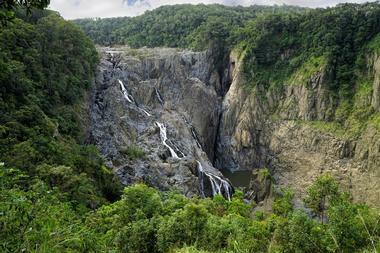 Visitors will enjoy breathtaking views of the surrounding lush-green rainforest and Barron Falls. Stoney Creek Falls is a picturesque, cascading waterfall that descends to the coastal plains of Cairns in Queensland, Australia. 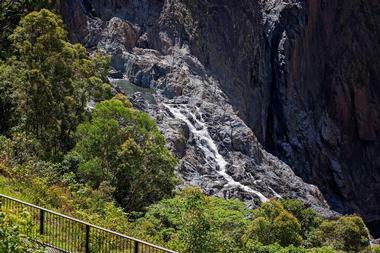 Stoney Creek is situated within a lower section of Barron Gorge National Park. There’s a path that winds through the pristine rainforest and along the river that is easy to negotiate for anyone, making it an experience that is perfect for the whole family. Along the trail to the waterfall, visitors will cross a small bridge before reaching several freshwater swimming pools that are perfect for a quick dip. The trail is covered by plenty of vines and ancient trees that provide welcomed shade during the hot summers. The waterfalls provide visitors with magnificent photo opportunities. Sugarworld is a council-owned, community water park that is located in Edmonton, Queensland, Australia. The water park is situated on 17 acres of historical parkland, surrounded by lush-green vegetation and beautiful peacock birds. Sugarwold offers all of the modern facilities required for visitors to enjoy a fun-filled day under the sun. 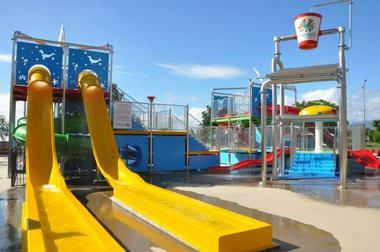 Some of the park’s attractions include interactive aquatic play areas, pools, waterslides, and a canteen area. The Tandem Tube Raft Slide and Mat Racer Slide are a couple of the park’s more popular, adrenaline-pumping slides. Just a short 20-minute drive from downtown Cairns, Sugarworld provides a fun and unique setting that is perfect for the whole family. The Tinaroo Dam, also known as the Tinaroo Falls Dam, is a concrete gravity dam that is situated on the Atherton Tablelands in north Queensland, Australia. Tropical North Queensland isn’t known for having a surplus of natural lakes, its mountainous countryside landscape yields thousands of rivers and creeks, but very little lakes. The Tinaroo Dam is a man-made reservoir that offers a source of water for farmers’ to irrigate with, produces hydroelectric power in small amounts, and provides a picturesque setting where visitors can enjoy a number of outdoor, recreational activities. Visitors will have the chance to enjoy fishing, hiking, wind-surfing, sailing, boating, swimming, and camping. Tjapukai Aboriginal Cultural Park is a place where visitors can come and experience the rich history of one of the oldest living cultures in the world – dating back more than 40,000 years. The Aboriginal Cultural Park is located in Smithfield, Queensland, Australia. Whether travelers visit the park during the day or night, they’ll enjoy a beautiful cultural experience that includes arts, dance, performances, and food. The experience provides a way for visitors to gain an intimate and deeper understanding of the diverse Aboriginal heritage that is such an important part of Australia’s history. This unique attraction is a must-visit when vacationing in Cairns.